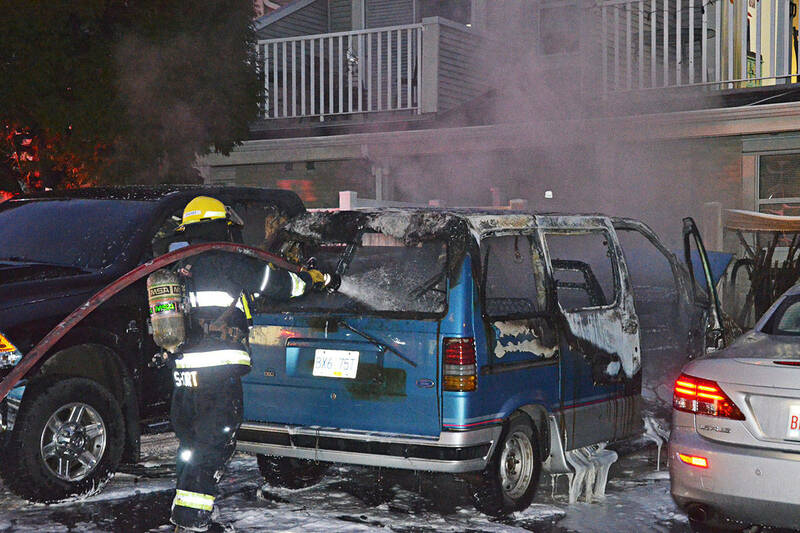 Firefighters doused a car fire that sent a lot of smoke into the air in Langley. Dec. 15, 2017 5:00 p.m.
A van was destroyed by fire near the corner of 200th Street and 64th Avenue at around 4:30 p.m. on Friday. The van, apparently parked in a lot behind the Canadian Wester Bank, sent plumes of black smoke into the sky during the afternoon rush hour. The fire also damaged a vinyl fence, and the area smelled strongly of burned plastic. Langley Township firefighters extinguished the blaze.